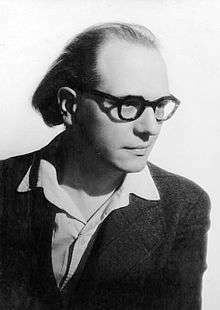 Olivier-Eugène-Prosper-Charles Messiaen (French: [ɔlivje mɛsjɑ̃]; December 10, 1908 – April 27, 1992) was a French composer, organist, and ornithologist, one of the major composers of the 20th century. His music is rhythmically complex; harmonically and melodically it often uses modes of limited transposition, which he abstracted from his early compositions and improvisations. Messiaen also drew on his Roman Catholic faith for his pieces. He travelled widely and wrote works inspired by diverse influences such as Japanese music, the landscape of Bryce Canyon in Utah and the life of St. Francis of Assisi. He said he perceived colours when he heard certain musical chords (a phenomenon known as synaesthesia in its literal manifestation); combinations of these colours, he said, were important in his compositional process. For a short period Messiaen experimented with the parametrisation associated with "total serialism", in which field he is often cited as an innovator. His style absorbed many global musical influences such as Indonesian gamelan (tuned percussion often features prominently in his orchestral works). Messiaen entered the Paris Conservatoire at the age of 11 and was taught by Paul Dukas, Maurice Emmanuel, Charles-Marie Widor and Marcel Dupré, among others. He was appointed organist at the Église de la Sainte-Trinité in Paris in 1931, a post held until his death. He taught at the Schola Cantorum de Paris during the 1930s. On the fall of France in 1940, Messiaen was made a prisoner of war, during which time he composed his Quatuor pour la fin du temps ("Quartet for the end of time") for the four available instruments—piano, violin, cello and clarinet. The piece was first performed by Messiaen and fellow prisoners for an audience of inmates and prison guards. He was appointed professor of harmony soon after his release in 1941, and professor of composition in 1966 at the Paris Conservatoire, positions he held until his retirement in 1978. His many distinguished pupils included Quincy Jones, Pierre Boulez, Karlheinz Stockhausen and Yvonne Loriod, who became his second wife. Olivier-Eugène-Prosper-Charles Messiaen was born December 10, 1908 in Avignon, France, into a literary family. He was the elder of two sons of Cécile Sauvage, a poet, and Pierre Messiaen, a teacher of English who translated the plays of William Shakespeare into French. Messiaen's mother published a sequence of poems, L'âme en bourgeon ("The Budding Soul"), the last chapter of Tandis que la terre tourne ("As the Earth Turns"), which address her unborn son. Messiaen later said this sequence of poems influenced him deeply and he cited it as prophetic of his future artistic career. He took piano lessons having already taught himself to play. His interest included the recent music of French composers Claude Debussy and Maurice Ravel, and he asked for opera vocal scores for Christmas presents. Around this time he began to compose. 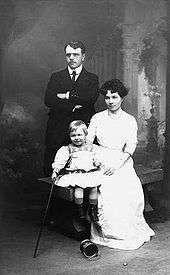 In 1918 his father returned from the war and the family moved to Nantes. He continued music lessons; one of his teachers, Jehan de Gibon, gave him a score of Debussy's opera Pelléas et Mélisande, which Messiaen described as "a thunderbolt" and "probably the most decisive influence on me". The following year Pierre Messiaen gained a teaching post in Paris. Messiaen entered the Paris Conservatoire in 1919, aged 11. At the Conservatoire, Messiaen made excellent academic progress. In 1924, aged 15, he was awarded second prize in harmony, having been taught in that subject by professor Jean Gallon. In 1925 he won first prize in piano accompaniment, and in 1926 he gained first prize in fugue. After studying with Maurice Emmanuel, he was awarded second prize for the history of music in 1928. Emmanuel's example engendered an interest in ancient Greek rhythms and exotic modes. After showing improvisation skills on the piano Messiaen studied organ with Marcel Dupré. Messiaen gained first prize in organ playing and improvisation in 1929. After a year studying composition with Charles-Marie Widor, in autumn 1927 he entered the class of the newly appointed Paul Dukas. Messiaen's mother died of tuberculosis shortly before the class began. Despite his grief, he resumed his studies, and in 1930 Messiaen won first prize in composition. He married the violinist and composer Claire Delbos also in 1932. Their marriage inspired him to both compose works for her to play (Thème et variations for violin and piano in the year they were married) and to write pieces to celebrate their domestic happiness, including the song cycle Poèmes pour Mi in 1936, which he orchestrated in 1937. Mi was Messiaen's affectionate nickname for his wife. In 1937 their son Pascal was born. The marriage turned to tragedy when Delbos lost her memory after an operation and spent the rest of her life in mental institutions. 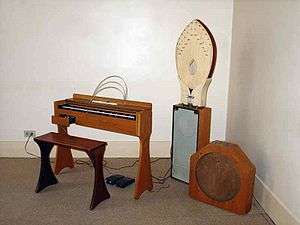 In response to a commission for a piece to accompany light-and-water shows on the Seine during the Paris Exposition, in 1937 Messiaen demonstrated his interest in using the ondes Martenot, an electronic instrument, by composing Fêtes des belles eaux for an ensemble of six. He included a part for the instrument in several of his subsequent compositions. During this period he composed several multi-movement organ works. He arranged his orchestral suite L'ascension ("The Ascension") for organ, replacing the orchestral version's third movement with an entirely new movement, Transports de joie d'une âme devant la gloire du Christ qui est la sienne ("Ecstasies of a soul before the glory of Christ which is the soul's own") ( listen ). He also wrote the extensive cycles La Nativité du Seigneur ("The Nativity of the Lord") and Les corps glorieux ("The glorious bodies"). At the outbreak of World War II, Messiaen was drafted into the French army. Due to poor eyesight, he was enlisted as a medical auxiliary rather than an active combatant. He was captured at Verdun and taken to Görlitz in May 1940, and was imprisoned at Stalag VIII-A. He met a violinist, a cellist and a clarinettist among his fellow prisoners. He wrote a trio for them, which he gradually incorporated into his Quatuor pour la fin du temps ("Quartet for the End of Time"). The Quartet was first performed in January 1941 to an audience of prisoners and prison guards, with the composer playing a poorly maintained upright piano in freezing conditions. Thus the enforced introspection and reflection of camp life bore fruit in one of 20th-century classical music's acknowledged masterpieces. The title's "end of time" alludes to the Apocalypse, and also to the way in which Messiaen, through rhythm and harmony, used time in a manner completely different from his predecessors and contemporaries. In 1943, Messiaen wrote Visions de l'Amen ("Visions of the Amen") for two pianos for Yvonne Loriod and himself to perform. Shortly thereafter he composed the enormous solo piano cycle Vingt regards sur l'enfant-Jésus ("Twenty gazes upon the child Jesus") for her. Again for Loriod, he wrote Trois petites liturgies de la présence divine ("Three small liturgies of the Divine Presence") for female chorus and orchestra which includes a difficult solo piano part. Messiaen taught an analysis class at the Paris Conservatoire. In 1947 he taught (and performed with Loriod) for two weeks in Budapest. In 1949 he taught at Tanglewood. Beginning in summer 1949 he taught in the new music summer school classes at Darmstadt. While he did not employ the twelve-tone technique, after three years teaching analysis of twelve-tone scores, including works by Arnold Schoenberg, he experimented with ways of making scales of other elements (including duration, articulation and dynamics) analogous to the chromatic pitch scale. The results of these innovations was the "Mode de valeurs et d'intensités" for piano (from the Quatre études de rythme) which has been misleadingly described as the first work of total serialism. It had a large influence on the earliest European serial composers including Pierre Boulez and Karlheinz Stockhausen. During this period he also experimented with musique concrète, music for recorded sounds. When in 1952 Messiaen was asked to provide a test piece for flautists wishing to enter the Paris Conservatoire, he composed the piece Le merle noir for flute and piano. While he had long been fascinated by birdsong, and birds had made appearances in several of his earlier works (for example La Nativité, Quatuor and Vingt regards), the flute piece was based entirely on the song of the blackbird. While he was instrumental in the academic exploration of his techniques (he compiled two treatises: the later one in five volumes was substantially complete when he died and was published posthumously), and was himself a master of music analysis, he considered the development and study of techniques to be a means to intellectual, aesthetic and emotional ends. Thus Messiaen maintained that a musical composition must be measured against three separate criteria: it must be interesting, beautiful to listen to, and it must touch the listener. Developments in modern French music were a major influence on Messiaen, particularly the music of Claude Debussy and his use of the whole-tone scale (which Messiaen called Mode 1 in his modes of limited transposition). Messiaen very rarely used the whole-tone scale in his compositions because, he said, after Debussy and Dukas there was "nothing to add", but the modes he did use are all similarly symmetrical. Messiaen had a great admiration for the music of Igor Stravinsky, particularly the use of rhythm in earlier works such as The Rite of Spring, and his use of colour. He was further influenced by the orchestral brilliance of Heitor Villa-Lobos, who lived in Paris in the 1920s and gave acclaimed concerts there. Among composers for the keyboard, Messiaen singled out Jean-Philippe Rameau, Domenico Scarlatti, Frédéric Chopin, Debussy and Isaac Albéniz. 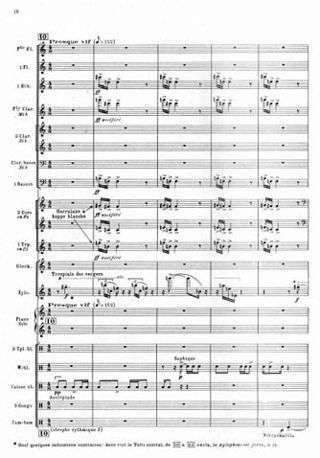 He loved the music of Modest Mussorgsky and incorporated varied modifications of what he called the "M-shaped" melodic motif from Mussorgsky's Boris Godunov, although he modified the final interval in this motif from a perfect fourth to a tritone (Example 3). From his earliest works, Messiaen used non-retrogradable (palindromic) rhythms (Example 2). He sometimes combined rhythms with harmonic sequences in such a way that if the process were allowed to proceed indefinitely the music would eventually run through all the possible permutations and return to its starting point. For Messiaen, this represented the "charm of impossibilities" of these processes. He only ever presented a portion of any such process, as if allowing the informed listener a glimpse of something eternal. In the first movement of Quatuor pour la fin du temps the piano and cello together provide an early example. Messiaen used modes which he called modes of limited transposition. They are distinguished as groups of notes which can only be transposed by a semitone a limited number of times. For example, the whole-tone scale (Messiaen's Mode 1) only exists in two transpositions: namely C–D–E–F♯–G♯–A♯ and D♭–E♭–F–G–A–B. Messiaen abstracted these modes from the harmony of his improvisations and early works. Music written using the modes avoids conventional diatonic harmonic progressions, since for example Messiaen's Mode 2 (identical to the octatonic scale used also by other composers) permits precisely the dominant seventh chords whose tonic the mode does not contain. As well as making use of non-retrogradable rhythm and the Hindu decî-tâlas, Messiaen also composed with "additive" rhythms. This involves lengthening individual notes slightly or interpolating a short note into an otherwise regular rhythm (see Example 3), or shortening or lengthening every note of a rhythm by the same duration (adding a semiquaver to every note in a rhythm on its repeat, for example). 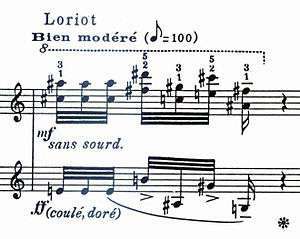 This led Messiaen to use rhythmic cells that irregularly alternate between two and three units, a process which also occurs in Stravinsky's The Rite of Spring, which Messiaen admired. A factor that contributes to Messiaen's suspension of the conventional perception of time in his music is the extremely slow tempos he often specifies (the fifth movement Louange à l'eternité de Jésus of Quatuor is actually given the tempo marking infiniment lent). Messiaen also used the concept of "chromatic durations", for example in his Soixante-quatre durées from Livre d'orgue ( listen ), which is built from, in Messiaen's words, "64 chromatic durations from 1 to 64 demisemiquavers [thirty-second notes]—invested in groups of 4, from the ends to the centre, forwards and backwards alternately—treated as a retrograde canon. The whole peopled with birdsong." In addition to making harmonic use of the modes of limited transposition, he cited the harmonic series as a physical phenomenon which provides chords with a context which he felt to be missing in purely serial music. An example of Messiaen's harmonic use of this phenomenon, which he called "resonance", is the last two bars of his first piano Prélude, La colombe ("The dove"): the chord is built from harmonics of the fundamental base note E.
Birdsong fascinated Messiaen from an early age, and in this he found encouragement from his teacher Dukas, who reportedly urged his pupils to "listen to the birds". Messiaen included stylised birdsong in some of his early compositions (including L'abîme d'oiseaux from the Quatuor pour la fin du temps), integrating it into his sound-world by techniques like the modes of limited transposition and chord colouration. His evocations of birdsong became increasingly sophisticated, and with Le réveil des oiseaux this process reached maturity, the whole piece being built from birdsong: in effect it is a dawn chorus for orchestra. The same can be said for "Epode", the five-minute sixth movement of "Chronochromie", which is scored for eighteen violins, each one playing a different birdsong. Messiaen notated the bird species with the music in the score (examples 1 and 4). The pieces are not simple transcriptions; even the works with purely bird-inspired titles, such as Catalogue d'oiseaux and Fauvette des jardins, are tone poems evoking the landscape, its colours and atmosphere. A number of Messiaen's compositions were not sanctioned by the composer for publication. They include the following, some of which have been published posthumously and recorded, and some of which are lost. Technique de mon langage musical ("The technique of my musical language"). Paris: Leduc, 1944. Vingt leçons d'harmonie ("20 harmony lessons"). Paris: Leduc, 1944. Traité de rythme, de couleur, et d'ornithologie (1949–1992) ("Treatise on rhythm, colour and ornithology"), completed by Yvonne Loriod. 7 parts bound in 8 volumes. Paris: Leduc, 1994–2002. Analyses of the Piano Works of Maurice Ravel, edited by Yvonne Loriod, translated by Paul Griffiths. [Paris]: Durand, 2005. ↑ Griffiths & Nichols 2002. ↑ Hill & Simeone 2005, p. 7. ↑ "Messiaen Edition". ArkivMusic. Retrieved September 8, 2013. ↑ "Olivier Messiaen". Schott Music. Retrieved September 8, 2013. ↑ Bruhn, Siglind; Deely, John (January 1996). "Religious Symbolism in the Music of Olivier Messiaen". The American Journal of Semiotics. 13 (1): 277–309. doi:10.5840/ajs1996131/412. ↑ Coleman, John (November 24, 2008). "Maestro of Joy". America: the National Catholic Review. Retrieved September 8, 2013. ↑ Benitez, Vincent (July 2009). "Reconsidering Messiaen as Serialist". Music Analysis. 28 (2–3): 267–299. doi:10.1111/j.1468-2249.2011.00293.x. ↑ Benitez, Vincent (April 2004). "Aspects of Harmony in Messiaen's Later Music: An Examination of the Chords of Transposed Inversions on the Same Bass Note". Journal of Musicological Research. 23 (2): 187–226. doi:10.1080/01411890490449781. ↑ Bruhn, Siglind (2008). "Traces of a Thomistic De musica in the Compositions of Olivier Messiaen". Logos. 11 (4): 16–56.